Back in Malaysia for the summer holidays, Looi Shin Yee and Liew Khye Borg came back to share stories and their experience studying in the United States of America. Both are alumni of the A-Level programme at Sunway College. Looi Shin Yee, currently in her second year at the University of Washington (UW), Seattle shared her views on work, the city she lives in and the people. The Bachelor of Science with a Major in Economics student who works on campus encouraged students to work while studying for real world exposure. Looi, a KPM (Kementerian Pendidikan Malaysia) scholar completed her A-Level at Sunway College in 2013 and went on to University of Washington under the Public Service Department (JPA) scholarship. 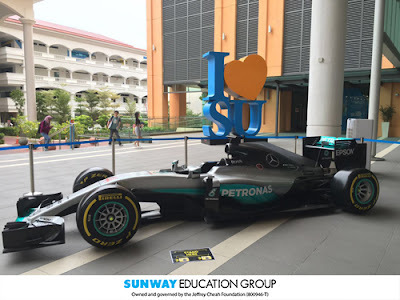 Thousands of students had a life-time opportunity to take a selfie with the actual F1 car that was driven by Lewis Hamilton here on campus. As a part of this event, four Lamborghini arrived on campus as a surprise for all students and staff. 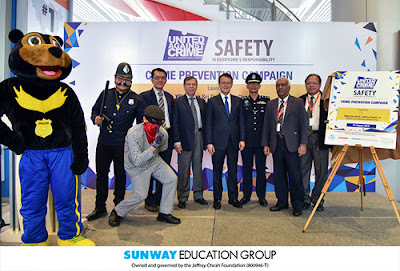 In a move to create awareness that safety is everyone’s responsibility, the Sunway Group in partnership with the Malaysia Crime Prevention Foundation (MCPF) organised a Safety and Security Campaign throughout the month of August. The campaign in conjunction with crime prevention month aimed to expose students of the Sunway Education Group, staff of all the business units under the Sunway Group and the Sunway community in general on various and current threat scenarios. We would like to congratulate Divya a/p Thiagu for winning the prestigious Harvard Prize Book Award! 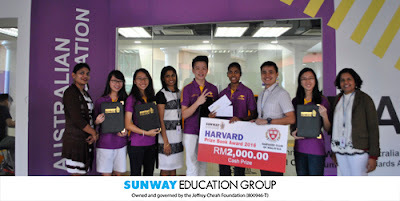 Divya is one of the four winners selected from fifteen shortlisted candidates. 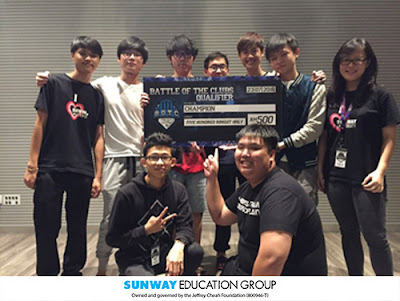 Congratulations are also extended to Bryan Tan Hou Quan, Lai Jia Wye, Clarissa Chia Ming Li and Esther Cheok Mei Yuin who were the finalists of this prestigious award. Sunway University e-Sports Club represented our university for the upcoming League of Legends Battle of The Clubs (B.O.T.C). 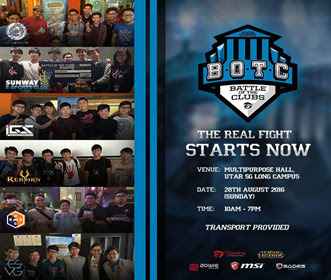 They will be competing against 6 other Universities @ Multipurpose Hall, UTAR Sungai Long on 28th August 2016 for a chance to get that RM7.5k cash prize pool! 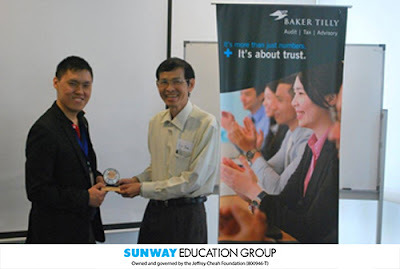 SCSC members visited the Baker Tilly, able to meet the partner of Baker Tilly/ Ferrier Hodgson, and communicated with him. Via the communication, they received some advices about the future pathway such as the professional paper and job. On the 10th September 2016 (Saturday), a community service project was carried out at the Lighthouse Welfare Home in Bangsar. 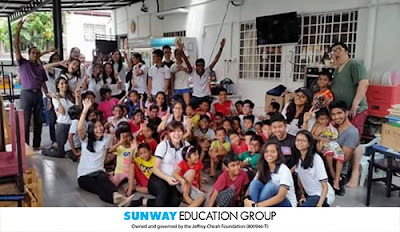 Twenty-six members and guests of the Rotaract Club of Sunway University participated in this project. 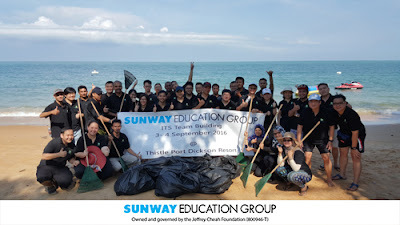 Among them, three were from the Rotaract Club of Sentul. There were four sessions: two games, a tea time and group photograph. 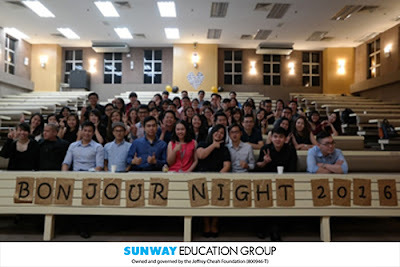 On 9th of August 2016, SCSC club had organized an event named “Bonjour Night 2016”. The purpose of this event is to welcome new members who joined us in semester 2 2016, as well as meeting the alumni of SCSC club. 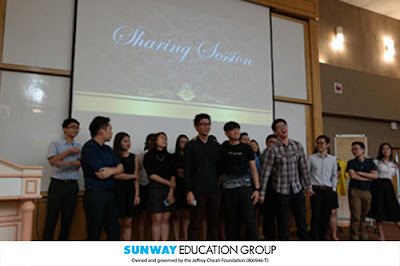 The theme of the event is “never ending love and passion”, where the meaning behind it is that SCSC members are always and will continue to be a family no matter who had left the club or graduated. Ng Jia Jen from the Sunway Robotics Club (Person in the middle) represented Malaysia to the 28th International Olympiad in Informatics @ Kazan University, Russia from 12th-19th August 2016 against 350 participants from around the world for a robotics competition. 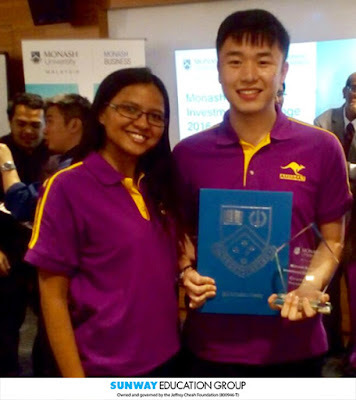 Congratulations to our AUSMAT student, Joel Chan Kheng Hong who won the Grand Prize Award at the Monash Business Investment Competition 2016. 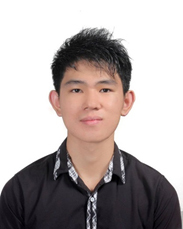 Joel is one of the four winners selected from 42 pre-university participants from around the Klang Valley. As part of our contribution towards Corporate Social Responsibility (CSR) agenda, this year Sunway Education Group (SEG) IT Services (ITS) Department takes the initiative to incorporate beach clean-up programme into our annual team building event. 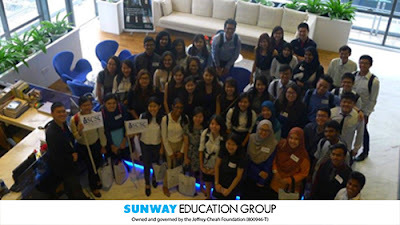 It was not the usual Saturday for a group of 40 AUSMAT students as they had a learning experience beyond the classroom. These students had the opportunity to participate in an excursion to visit a wildlife sanctuary. 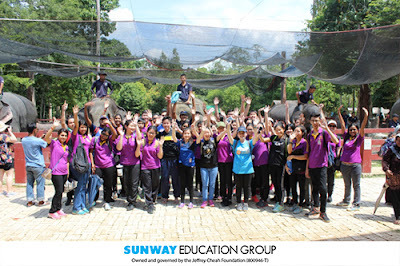 Through the initiative of their lecturer Ms. Sangeetha Muniandy, the main purpose of this outing was to understand Corporate Social Responsibility (CSR) and how it affects the environment. The VU Entrepreneurship & Career Boot Camp was organized by Victoria University (VU) Programme on 14th August 2016. 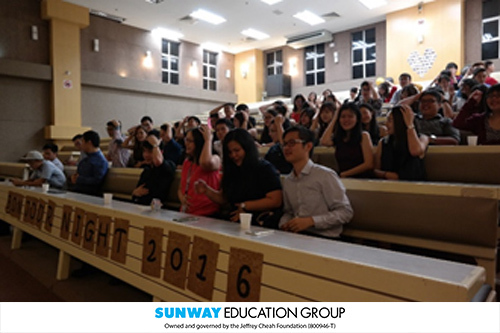 It was held in the Jeffery Cheah Hall. This boot camp is an effort by Victoria University programme to provide a value added learning experience for the VU Bachelor of Business students who are currently enrolled in the Applied Business Challenge module of the Professional Development (PD) series. This provided the students an opportunity to gain insight into business start-up and entrepreneurship. 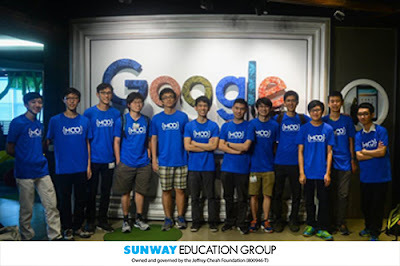 Most importantly, the boot camp enabled students to kick start their career, with the opportunity of securing either employment upon graduation or an internship. 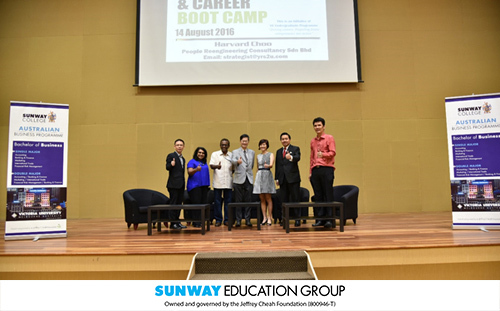 The master minds of the boot camp are Ms Alagarani, who is the Lead Facilitator of the Applied Business Challenge module and Mr Harvard Choo, Founder of People Reengineering Consultancy. The boot camp continued with Innovation and Entrepreneurship Dialogue chaired by Dr Benedict. This Dialogue was an in depth conversation with the entrepreneurs. The Q&A session was rife with burning questions from the students. The speakers were both informational and entertaining in their dialogue. School Curriculum and Standards Authority (SCSA) Board Chairman Emeritus Professor Patrick Garnett and Dr Pam Garnett paid a visit to the Sunway College campus on September 1, 2016. Professor Garnett was treated to a special luncheon followed by a delightful afternoon with AUSMAT academic staff and AUSMAT Student Council during which they had a wonderful time discussing the opportunities and challenges in the ever-changing landscape of tertiary education. 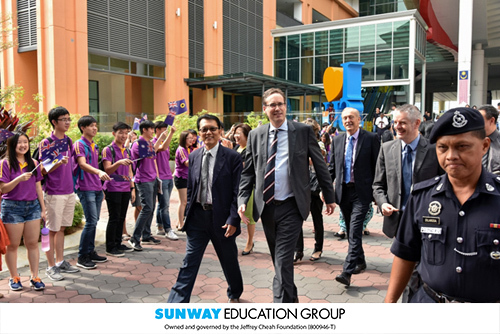 Professor Garnett deeply appreciated the three-decade strong partnership between Sunway College and SCSA and Sunway’s commitment to upholding the high quality of the programme consistent with that of Western Australian schools. 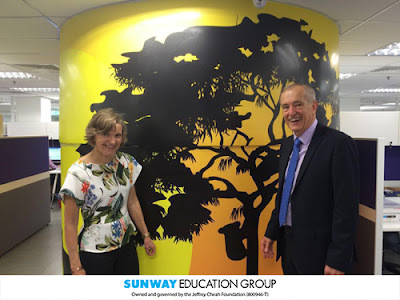 Prof Patrick & Dr Pam impressed with Australian Themed Landscape in AUSMAT office. 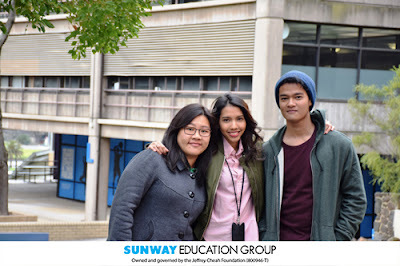 Together with the 3300 strong student population in the various Australian programmes on Sunway campus, the Victoria University (VU) tertiary programmes, Australian Matriculation (AUSMAT), and Monash University Foundation Year (MUFY) collaborated in organizing the inaugural Australia Week, which took place from 1st to 5th September 2016 on Sunway campus, to celebrate Australian culture and values beyond the classroom. The Sunway College A-Level tea party, a bi-annual event was held recently to acknowledge and celebrate students’ achievements in the June 2016 Cambridge International A-Levels examinations. Students of this cohort achieved a 100% pass rate with 32 students having achieved 4A*s.
Many have received offers and secured places in some of the top universities in the world. 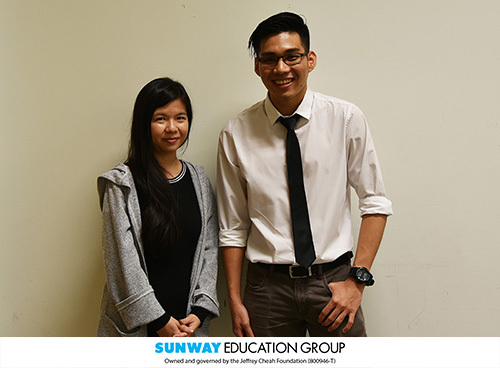 Among them are Lai Dee Loon who received an offer to pursue Engineering in the University of Cambridge, Saheb Singh with an offer to study Philosophy, Politics and Economics in the University of Warwick and Nur Aina Muhammad Naim who secured a place at the University of Nottingham, Malaysia. A Level top scorers with their lecturers.